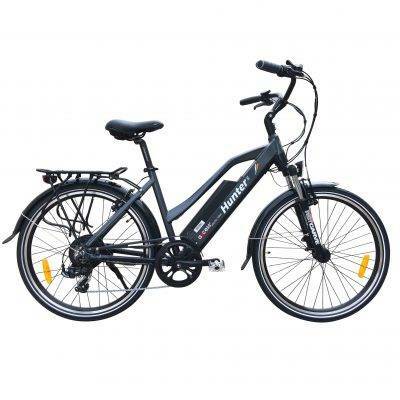 The Zycle lightweight ebike is an innovative & attractive electric bike weighing only 18kg with an 8Ah battery. Ideally suited to road use. The 20″ wheels, gears and control mechanism makes it easy to navigate in and out of urban areas. The specially designed battery box has the latest Samsung Lithium cells and fits just forward of the seat post. The black anodised aluminium handlebars fold down easily, the pedals fold in and the quick release front wheel makes it easy to transport and store in a small space. There is a choice of five levels of electric power assistance, with a torque sensor changing the ratios between the pressure on the pedals and the power delivered by the motor. You have the option of high speed and maximum power with little pressure on the pedals or background assistance if you want to get more exercise or you can choose to turn the pedal assist off and ride it as a normal bike. There is a 4mph start button for hill starts. The 250watt motor (the maximum allowed for UK road) is powered by a 36 volt 8Ah battery with a range of 20 -25 miles of riding on medium power assist. Batteries can be charged on the bike or unlocked and removed, with a charging time of 4 hours and a USB power take-off point for other accessories. The box itself slides sideways into the frame and locks into place. Special 3 speed derailleur with twin lever change on the handlebars means as soon as the pedals are pressed, the motor will give you assistance. The greater the pressure on the pedals the more power. This ensures the smoothest of riding experiences. The Zycle is fitted with full-length PVC mudguards and solid blade forks. Tektro cable disc brakes front and rear give a good performance in the wet. Kenda 20″ X 1.75″ road tyre with reflective strip and alloy rims with stainless steel spokes. The batteries have a two-year guarantee against 20% loss of capacity. The right is reserved to inspect the battery for signs of neglect, lack of use, misuse or immersion in water. All other components (excluding consumables) are guaranteed for a year.